Replacements (16-23): R Herring, K McCall, R Ah You, M Dalton, C Henry, J Stewart, D Cave, L Ludik. Well Don's selection wasn't too far off. You'd think that side can bag the 5 points but in this srason who knows. Shame no O'Hagan but delighted to see McPhillips and Lyttle starting, and the U20s boys on the bench. Surely it wouldn't have been too big a risk to have McBurney on the bench - maybe Herring is there to make sure he keeps his fitness for Ireland training camp? Don Alfonso wrote: You know what? Just thinking about it, when Marshall goes, his highlights montage will be something else. He will have to have two. Desperately underrated player. Definitely past his best now but when he got a run of games a few years back was a very good player. People I think focus too much on his mistakes. Wee P, whilst not being the epitome of consistency has always given 100% of what he had to give to the shirt and despite his stature has never shirked tackling someone twice his size. I believe he is indeed underrated. Deysel I cant see, he will stay for 1 more year, but deMerwe I can see a possibility. A LH and a 10 seen as the priority signings - along with Coetzee being fit or being replaced. With him its easier we have a get out clause if he is medical deemed as not being fit for next year. Dooley would be the perfect answer to the problem, VdM could languish wherever he saw fit as he's been an awful signing. As much as we'd all love a big marquee NIQ 10 to be signed perhaps McPhillips will flourish through the rest of this season and we'll not need one, well I'm allowed to dream aren't I? Munster are coming down with 10s and I get the feeling JJ will be sent north which may or may not be a bad thing. McPhillips may well come good but you cannot rely on a youngster playing every week without injury. Everyone all set for the new era of Ulster Rugby? clivemcl wrote: Everyone all set for the new era of Ulster Rugby? It looks very like the Les era. Remember the Les era? Angry man to shout at all our players till they sort their s**t out? Maybe a strong hand to do the firing? Allegedly the IRFU have reduced funds until they see change, primarily in branch governance, and redirected those funds into Munster and Connacht - where they have hands-on control. I've been critical of Cunningham for buying lemons, but it seems that's all his budget could stretch to. Now he has been given the go ahead to clear out the more expensive players at the end of their contracts, as that is the only way to balance the books? The Great Aukster wrote: Maybe a strong hand to do the firing? So Farrell could be coming in to force change through? The IRFUs loan surgeon to cut away the dead flesh, as it were. An epic brutal blood letting up there with hamlet? Anyway about last night. McPhillips looks good. Not afraid to take the hits, finding his timing with his passes and best of all doesn't look out of his depth or scared to play. Can only get better. Just reflecting on last nights match it's very hard to tell if Ulster were better than before because Southern Kings have not been good this year but at least they did score a number of tries and kept the Southern Kings mostly out of our try area. On of the very positives I though was McPhillips, I was impressed the way he took it to the line, mixed up running, passing and kicking well and was barking out orders to more experienced team mates. Again it was only the Southern Kings but it was very encouraging. Injuries from last night will be a worry though, not like we have a huge squad to begin with. If Farrell is coming you would imagine it will be as a defence coach which would be very useful, my hope would be that Cunningham starts to handle some of the tasks of a DOR such as the transfers, contracts, admin etc and Gibbes can focus on being a head coach and trying to get the team in shape. I think one improvement we had last night, we kicked the bloody ball, instead of poor kicks to touch or being afraid to kick it we actually did it tactically and McPhillips kicked towards space and turned the Kings defence. Instead of having to play out of our 22 and facing a wall or facing waves of attack, the ball was further up the field and there was less pressure on defence. Like everyone said, maybe the opposition played a part in the performance but against the same opposition we struggled with some of those facets of the game. From Joe comments, Farrell coming in and the BBC report, are things maybe looking more positive for Payne? The area of defence coaching may need bolstered before next season and while Ulster are looking at Jared Payne in a potential future role, they are hopeful he will return as a player in the near future rather than a coach. So Schmidt keeping up the fantasy that Payne will come back. Reality is the guy has pain every week including injections to relieve the pain. Well we could do with a couple of players to cover 10 and the back three, on the bench, next week ! Stewart's passing seemed a bit faster last night. His 1 previous game was into a hurricane so maybe he was just being careful on his debut. Is he left handed? His passing to the right seemed stronger than his passing to the left. For passes left he did that stupid Marshall-esque hop, skip and pass thing. McPhillips is actually a 10. As has been said, he had a complete armchair ride but does seem to have some potential. Amazing to think that Ulster had basically written him off as a player and through a bizarre combination of events he's now our starting 10. Gilroy should be with Ireland but sadly I fear even if he hadn't been injured Joe still wouldn't have picked him. Herbst had a good game, especially in terms of carrying. When you look at the team it's almost unrecognisable in certain respects. Treadwell, Timoney and Rea are now pretty much nailed on starting XV players. They couldn't get a look in last year (except for Treadwell-ish). Defence looked better. Yes Kings are useless but our line speed was noticeably better. On the Farrell point, do we know what the overall objective is? Is it to find Farrell a permanent job? Is it to keep him busy in the meantime. Is it to bring our defence coaching inline with what Ireland are doing? So Leinster and Scarlets both lost this weekend and play each other on Saturday, a BP win could see Ulster 3 points behind one of them and a game against Scarlets the following week. It really is woth going all out for 2nd place. 2nd plave most likily means home to Cheetahs 3rd away to Munster. Think you can guess which one is the more likily to leand to a semi final. I wonder is it a sign that Gibbs isn't for sticking around? Not saying I don't want Farrell, but why are we seemingly the place the IRFU offloads people too? clivemcl wrote: Not saying I don't want Farrell, but why are we seemingly the place the IRFU offloads people too? Farrell has already worked with Munster and Leinster, besides I'd imagine coaches aren't exactly queuing up to join us given how we're treated coaches in our recent history. I'd sack everyone that puts their hand up (and it seems it would be a sizeable number!) - and start again with what was left. Don't worry about Gibbes getting the sack, it's guaranteed he wouldn't have raised his hand - too humble and just wants the footie to do the talking. Too many endless chatter bosses up in Ulster.... telling all their pals all the little sordid details of what goes on behind the scenes too much. Too much intrigue, too much navel gazing.... even here, I sometimes think some of you guys know too much detail for your own good, with all your deep-throat contacts giving you snippets they should be keeping in-house. So anybody that thinks they are a boss up there should go straight away. Sorry toilet beautifying technician! But NO! - you is only a toilet beautifying technician engineer! That is all you are. Why limit that to Ulster Rugby Fly? Do it with the politicians too! Actually, Andy Farrell's next gig could be Stormont. Farrell's a smart guy, he simply wouldn't fit in with that lot on the hill who share a single brain cell, perhaps the one shared by those who voted them in yet again and again and again. Oops back the the rugger. 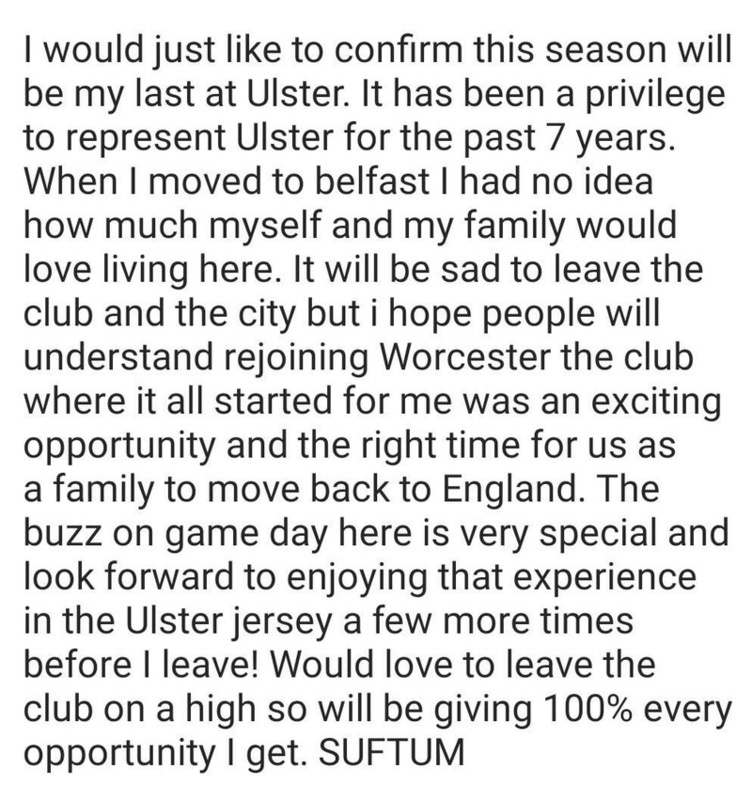 There's no doubt that Ulster need an external influence to give it a good cleaning out but my optimism doesn't stretch far enough to believe it could happen like this. I mean could it? I think its exactly what we need, a tough external voice coming in an knocking a few heads together. However that never sits well with the parochial environment in Ulster, will we just have certain players running to Logan and Cunningham if they don't get picked or don't like what they are being asked to do. This seems to be an ongoing issue that never seems to go away. Ulster have to appoint their top guy, not some fudged joint post and back them even if it ruffles a few feathers. Even with Kiss, although I wasn't impressed with a lot of what I was seeing, he should have been able to see his contract through, or at least to end of season. Danny cipriani is leaving wasps. Think he fancies a couple of years in Belfast? carpet baboon wrote: Danny cipriani is leaving wasps. Think he fancies a couple of years in Belfast? Do we need a back three signing? Or does the brilliance of Stockdale and the adequacy of Lyttle cover us for the loss of Piutau and Bowe? clivemcl wrote: Do we need a back three signing? Don't forget Gilroy! We have Ludik as well. I suppose it depends what is going on with Trimble and whether he can get back to something like his best. It looks like Stockdale will be an Ireland regular from here in so we need decent cover. I was sort of referring to the newbies taking the place of the leavers. Hadn't forgot Gilroy, Trimble and Ludik! Next season will be barely begun when Trimble turns 34, and Ludik 32. Any other academy boys likely to break through? If for example, Gilroy and Stockdale were with Ireland, we have Trimble, Ludik and Lyttle. Injuries could see us in a pickle.